Orovet is a simple rinse that freshens up breath, reduces tartar build up and gingivitis. This antiseptic oral rinse removes bacteria and keeps mouth fresh. It prevents plaque and tartar formation as well as control dental issues. This vet-recommended product is highly effective in maintaining dental health. 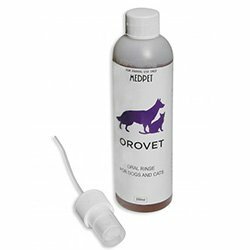 Orovet is specially formulated to treat plaque and tartar in dogs and cats. Developed with Chlorhexidine, it has the ability to bind to oral mucosa and skin. This ingredient helps to promote healing in the oral cavity after oral surgery by reducing the risk of infections due to bacteria. It reduces inflammation of the gums caused by the bacteria and aids in maintaining dental hygiene. It truly works! Our small dog, as all small dogs, has horrible dental issues. I had almost given up until we were guided to this product. Their breath is so much better and their teeth are almost pearly white again. We have only been using it for a few months, I can't wait to see the results in a year! It's dental month and my vet prescribed me to buy this item. I have begun utilizing it in my canine and a feline. It's best alternative for me as I can utilize it for both my children. Furthermore, it's very simple to utilize. Gotten it at immense markdown. Much obliged best vet watch over best arrangements. I purchased this product from my vet the first time . It is an amazing product. I have two miniature schnauzers and they produce a greater amount of plaque than other breeds and the oral rinse just melts it away. [use with finger brush and gently massage teeth]. I love this product. My dog 's mouth usually smells bad and I feel really irritated for the same. Tried many things but can't help this smell. My sis advised to use orovet oral rinse and I can't believe there is no foul smell now. Works best for my dog.